‘When we saw the crystal structure of our material, we soon realised that it could be mechanically exfoliated,’ explains Guillermo Mínguez, a researcher at ICMol at the University of Valencia, Spain, and one of the lead authors of the study. ‘Even though the use of this technique for coordination polymers was unprecedented, we decided to give it a try.’ And, surprisingly, it worked. 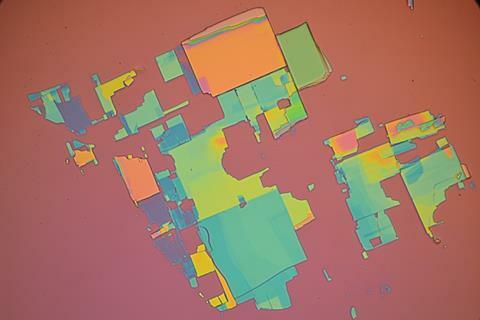 ‘Like with other 2D materials, we can deposit our MOF flakes onto silicon substrates,’ he says. ‘And they are beautiful, the thickest crystals are yellow, while the thinnest show a faint purple colour,’ adds Mínguez. By optimising a well-known solvent-free reaction3 the team obtained a material robust enough to withstand mechanical exfoliation. The new single layer MOF also shows unique magnetic properties. ‘To date, magnetic 2D systems had been elusive, with only a couple of key systems [reported],’ explains Eugenio Coronado, the director of ICMol and also lead author of the paper. ‘Besides, all these examples have serious disadvantages – they show very poor air stability, and tuning surface properties is rather complicated,’ he adds. ‘Usually, nano-sized MOFs are not suitable for applications due to their compromised stability towards moisture and air,’ explains Ana Platero-Prats, senior Talento fellow at the Autonomous University of Madrid, Spain. This discovery shows that ‘the MOF community is ready to move forward, and expand to the single-layer nano-world’, she adds. The team has been able to precisely tune some physical properties of their magnetic 2D MOF. ‘We can change the hydrophobicity of the surface in a very easy way – just by choosing the proper terminal group of the ligand,’ explains Mínguez. ‘This is very appealing and could open up the possibilities of these materials for applications like coatings or sensors,’ he adds. Platero-Prats agrees and says that ‘being able to mechanically exfoliate a MOF down to a single-layer offers new opportunities to prepare devices combining different 2D materials, [which] could certainly show new and unexpected properties’. Mínguez strongly believes that mechanical exfoliation could be used to prepare other 2D MOFs, offering an almost limitless range of new 2D materials with outstanding physical properties.